Author contributions: Khashab MA, Victor DW, Karakan T and Sherman S designed the manuscript; Khashab MA and Victor DW drafted the article; Khashab MA, Victor DW, Karakan T and Sherman S revised the article. Biliary strictures are considered indeterminate when basic work-up, including transabdominal imaging and endoscopic retrograde cholangiopancreatography with routine cytologic brushing, are non-diagnostic. Indeterminate biliary strictures can easily be mischaracterized which may dramatically affect patient’s outcome. Early and accurate diagnosis of malignancy impacts not only a patient’s candidacy for surgery, but also potential timely targeted chemotherapies. A significant portion of patients with indeterminate biliary strictures have benign disease and accurate diagnosis is, thus, paramount to avoid unnecessary surgery. Current sampling strategies have suboptimal accuracy for the diagnosis of malignancy. Emerging data on other diagnostic modalities, such as ancillary cytology techniques, single operator cholangioscopy, and endoscopic ultrasonography-guided fine needle aspiration, revealed promising results with much improved sensitivity. Cholangiocarcinoma is usually diagnosed at an advanced stage, which is the main reason for the poor prognosis of this tumor. Patients with T1 stage tumor who undergo resection have an excellent prognosis with a cumulative 5-year survival rate of about 100%. T1 stage tumors are confined to the bile-duct wall and are limited to the mucosa or fibromuscular layer of the bile duct and do not usually present with lymph node metastases. Therefore, a diagnosis of bile duct carcinoma in T1 stage is crucial for long term survival. Serum alkaline phosphatase and gamma-glutamyltransferase are elevated in 40% of these patients and 40% are non-icteric. Cholangiocarcinoma typically presents as biliary strictures. These strictures remain a diagnostic dilemma since a significant proportion of them remain indeterminate for malignancy despite radiologic, endoscopic, and laboratory testing. Early and accurate diagnosis impacts not only patients’ outcome and patients’ possible surgical candidacy, but also potential targeted chemotherapies. Since 13% to 24% of patients with presumed hilar cholangiocarcinoma are found to have benign disease[2,3], accurate diagnosis is paramount to avoid unnecessary surgery for patients with benign strictures. The difficulty is amplified when attempting to discern malignant from non-malignant strictures in patients with primary sclerosing cholangitis (PSC) as this affects transplantation decision. This review explores strategies that can be employed by the endoscopist to improve the diagnostic yield of endoscopic work-up in patients with indeterminate strictures. Biliary strictures are considered indeterminate when basic work-up, including transabdominal imaging and endoscopic retrograde cholangiopancreatography (ERCP) with routine cytologic brushing, are non-diagnostic. Transabdominal ultrasound (TUS) is usually the initial diagnostic modality used to investigate suspected biliary pathology. TUS is non-invasive, relatively cheap, widely available, and allows visualization of the biliary tree. However, TUS does not reliably examine the distal part of the common bile duct because of the interference of bowel gas. Abdominal computed tomography (CT) is useful for work-up of patients with suspected cholangiocarcinoma. However, it has suboptimal sensitivity for the detection of early tumors. Since its introduction in 1991, magnetic resonance cholangiopancreatography (MRCP) has emerged as an accurate noninvasive modality for biliary imaging. MRCP has a high sensitivity for bile-duct stenosis and filling defects associated with bile duct carcinoma; however, its specificity and positive predictive values are suboptimal as it cannot reliably distinguish malignant strictures from other strictures due to benign etiologies[8,9]. Still, some ductal features on MRCP and ERCP may suggest malignant or benign etiology of biliary strictures. Malignancy is suggested by long (> 10 mm), asymmetric, and irregular strictures. However, these criteria are not particularly sensitive or specific.Therefore, unless abdominal imaging detects biliary mass lesions, further endoscopic work-up is warranted to determine the etiology of biliary strictures. Intraductal brushing during ERCP (Figure 1) remains the first-line approach for tissue sampling of biliary strictures because of its wide availability and technical ease in most cases. However, most studies report a poor sensitivity of 27% to 56%[11-14]. Multiple strategies have been employed to improve the sensitivity without sacrificing the specificity. These have included novel brushes, biliary stricture dilation with subsequent brushings, repeated brushings, immunohistochemistry testing, mutational analysis, digital image analysis (DIA), and fluorescence in situ hybridization (FISH). 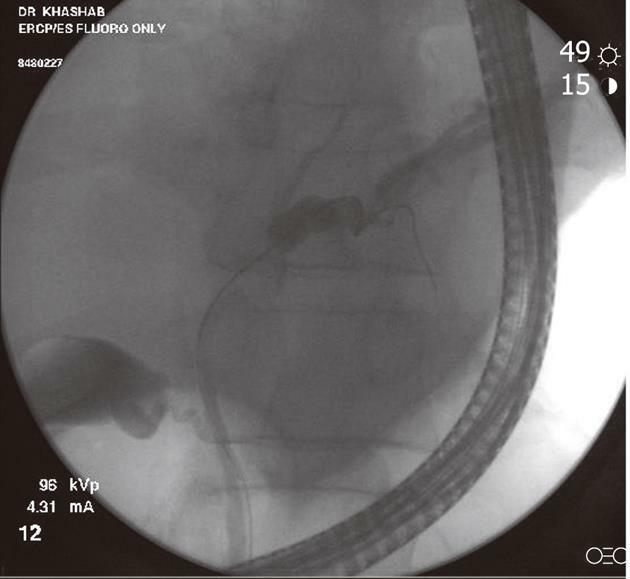 Figure 1 Fluoroscopic image during endoscopic retrograde cholangiopancreatography showing a hilar stricture with left intrahepatic biliary dilation. Endoscopic brushing was performed and routine cytology confirmed hilar cholangiocarcinoma. Fogel et al studied the use of a longer biliary cytology brush with stiffer bristles. Despite improved cellularity, cancer detection rates were not improved by using the new brush design. The low sensitivity of biliary brushings is attributed to the submucosal pattern of tumor growth or extrinsic malignancy. Interrupting the mucosa with endoscopic dilation may theoretically improve the cytologic yield. de Bellis et al studied this strategy by obtaining brushing cytology pre and post dilation. Sensitivity did not improve after dilation (35% and 31%, respectively); however, importantly, the combined sensitivity was improved at 44%. The authors concluded that stricture dilation was not helpful but that repeat biliary brushings increase the diagnostic yield. Inadequate biliary cytology specimens are the main reason for non-diagnostic samples. This may be overcome by the presence of an onsite cytopathologist or technician, which allows real time assessment of cytology samples and may decrease the likelihood of inadequate samples and improper sample preparation [same as widely practiced with endoscopic ultrasound-guided fine needle aspiration (EUS-FNA)]. If this is not possible, other practiced strategies include cutting the entire brush and submitting it to pathology in a fixative solution or creation of slides by the endoscopy team and placing them in a fixative solution prior to submission to pathology. Chromosomal abnormalities are typically seen in biliary tract malignancies. Flow cytometric analysis for DNA content has been used with moderate gains in sensitivity at 42%, but at the expense of a lower specificity of 77%. This technique is also limited by its requirement of a relatively large amount of tissue for examination. New ancillary cytologic techniques, such as FISH and DIA, have recently been used to improve the sensitivity of routine cytology for the diagnosis of malignancy in pancreatobiliary strictures. FISH analysis detects chromosomal polysomy using fluorescent probes, whereas DIA technique quantifies nuclear DNA via special stains to assess for the presence of aneuploidy[17,20,21]. Only 80% of pancreaticobiliary malignancies manifest these cellular alterations. Therefore, the sensitivity of these advanced techniques is still not optimal. Levy et al found that FISH improves sensitivity 14% to 24% when routine cytology is negative. Fritcher et al found that patients with abnormal FISH results were 77 times more likely to have carcinoma than those with normal FISH. They also found that DIA had a higher sensitivity (44.8%) than cytology. However, specificity was significantly lower at 89.1%. In addition, DIA was not found to be a significant independent predictor of malignancy. Therefore, FISH seems to be a more valuable ancillary cytologic technique for the evaluation of indeterminate biliary strictures. It is particularly useful in biliary malignancy as it requires fewer cells for analysis than routine cytology or flow cytometry. A recent report studied the additional value of including deletion of 9p21 (p16) in the diagnostic criteria of FISH for malignant biliary strictures. This significantly improved the sensitivity of FISH from 47% to 84%. It is crucial to realize that benign strictures in patients with PSC may manifest chromosomal abnormalities and, thus, the specificity of FISH in this setting (67%-88%) is lower than routine cytology. However, the sensitivity of FISH for malignancy in this setting is still higher than that of routine cytology at 72%. In short, FISH increases the sensitivity of brush cytology of indeterminate biliary strictures at the expense of a lower specificity. Therefore, FISH should be reserved for patients with high pre-test probability for malignant strictures (e.g., PSC patients with dominant stricture, patients with persistent elevation of carbohydrate antigen 19-9 after biliary decompression, etc.). Endobiliary forceps biopsy of biliary strictures during ERCP is another endoscopic technique used in routine clinical practice for sampling biliary strictures. In general, forceps biopsies have had the highest yield when compared to brush cytology and fluoroscopically-guided FNA. Cancer detection rates using endobiliary forceps range from 44% to 89 % for cholangiocarcinoma and 33% to 71 % for pancreatic cancer[24-27]. Wright et al studied the “smash protocol” for handling biopsies of biliary strictures obtained using endobiliary forceps. Biopsies were smashed between two glass slides, stained by rapid Papanicolaou, and immediately read by on-site pathologists in the ERCP suite. The authors found that immediate cytopathologic diagnosis at ERCP was established in 72 % of cases and concluded that this approach permits immediate diagnosis and avoids the need for subsequent procedures, adds little cost and time, and is safe to perform. External validation of these results is warranted. Jailwala et al showed that endobiliary forceps biopsy of biliary strictures had an incremental diagnostic yield for diagnosis of bile duct malignancy as compared to cytology alone. Triple sampling with brushing, transpapillary biopsy and endoluminal FNA had the highest sensitivity. The authors recommended the use of at least two sampling methods. However, endobiliary biopsy remains technically challenging (especially for proximal biliary strictures) and complications, including bleeding and biliary perforation, have been infrequently described. Jailwala et al remark that biopsy sampling added 10 to 15 min to the procedure time. Currently most biopsies are done using standard biopsy forceps alongside a guidewire which makes positioning the forceps more difficult. While adapted biopsy forceps[31,32] are used they are not widely available or utilized. Widely available dedicated biliary forceps are needed to improve the yield and safety of biliary biopsies. ERCP with intraductal ultrasound (IDUS) has also been utilized to improve the diagnostic yield of biliary strictures[33-35]. IDUS is accomplished by over-the-wire insertion of a small and high-frequency ultrasound probe into the biliary system through a standard duodenoscope under fluoroscopic guidance. Advantages of these probes include ease of biliary cannulation obviating the need for sphincterotomy in most cases, and the provision of high resolution, detailed images of ductal and periductal tissues without significantly lengthening the ERCP procedure. Moreover, although distant metastases and lymph node involvement may fall outside the imaging field of the device, IDUS can provide local staging required to select patients who would benefit from surgical resection when a malignancy is identified. IDUS has consequently emerged as an adjunct to ERCP in the evaluation of biliary strictures (Figure 2). Sonographic features seen during IDUS that are suggestive of malignancy include eccentric wall thickening with an irregular surface, a hypoechoic mass, heterogeneity of the internal echo pattern, a papillary surface, disruption of the normal three-layer sonographic structure of the bile duct, presence of lymph nodes, and vascular invasion. Findings suggestive of benign lesions include preservation of the normal three-layered sonographic appearance of the bile duct wall, homogeneous echo-rich masses with smooth margins, and the absence of a mass lesion. The accuracy of these criteria in patients with biliary strictures ranges from 83% to 90%[36,39,40]. IDUS has been shown to improve the diagnostic accuracy of ERCP (with routine cytology) to 58% to 90%[35,39,41]. The benefit of IDUS, however, is limited in the repeated evaluation of strictures, as the presence of a previously placed biliary stent affects its diagnostic yield. Lee et al favored EUS to IDUS given that their patients typically had prior stents placed for the treatment of indeterminate strictures. However, IDUS may have a role in concert with EUS, especially in patients without prior stent or in those with proximal biliary (e.g., hilar strictures) lesions, where EUS has shown suboptimal accuracy (see below)[35,43]. Figure 2 Intraductal ultrasound showing bile duct mass and surrounding lymph nodes. Endoscopic ultrasound (EUS) has become a valuable tool in the evaluation of lesions in the gastrointestinal tract as well as pancreaticobiliary system. It has the advantage of being able to both provide real time imaging of the GI tract and adjacent organs as well as obtain tissue through FNA. EUS-FNA has a sensitivity of about 85% and a specificity approaching 100% for the diagnosis of pancreatic tumors[44,45]. The role of EUS in indeterminate biliary strictures is still not well defined. EUS has a sensitivity and specificity comparable to MRCP in the diagnosis of pancreaticobiliary disease. Sai et al studied 123 non-icteric patients with elevated alkaline phosphatase and common bile duct dilation on TUS. MRCP followed by EUS had a sensitivity of 90% and specificity of 98% for the diagnosis of cholangiocarcinoma. The positive predictive value was also dramatically increased from 35% to 70% when EUS was added to MRCP. The advantages of EUS-FNA in the diagnostic work-up of patients with indeterminate biliary strictures are multiple. 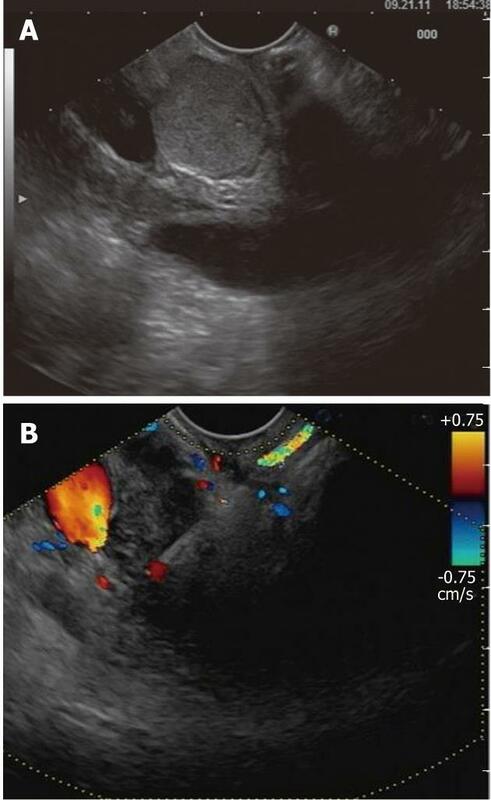 EUS may visualize a biliary mass missed by other imaging modalities in a significant proportion of patients (Figure 3). Eloubeidi et al reported visualizing a mass in 33% of patients following previously non-diagnostic imaging. Similarly, a more recent study reported a mass visualized on EUS in 94% of patients (Figure 4), while CT and magnetic resonance imaging (MRI) revealed a mass in only 30% and 42% of these patients, respectively. EUS allows performance of FNA of visualized masses with reported sensitivity for malignancy of 43% to 86%[42,47-49]. It is noteworthy mentioning that the sensitivity of EUS-FNA is significantly higher in distal than in proximal cholangiocarcinoma. Mohamadnejad et al studied 81 patients with cholangiocarcinoma who underwent EUS. Sensitivity of EUS-FNA was significantly higher in distal compared with proximal cholangiocarcinoma (81% vs 59%, respectively; P = 0.04). Another advantage of EUS is ability to define unresectable tumors in some patients where CT and/or MRI failed to detect unresectability. In addition, EUS-FNA permits identification of extraductal tumors and allows triage of patients to potential non-operative management (e.g., lymphoma, metastatic lesions)[50,51]. Therefore, EUS-FNA is an important diagnostic modality in patients with a distal indeterminate biliary stricture. ERCP remains the preferred initial approach in patients with proximal (defined as < 2 cm from the hilum) strictures. In symptomatic (i.e. icteric) patients, ERCP should still be the first-line approach because drainage can be accomplished concomitantly with tissue sampling. 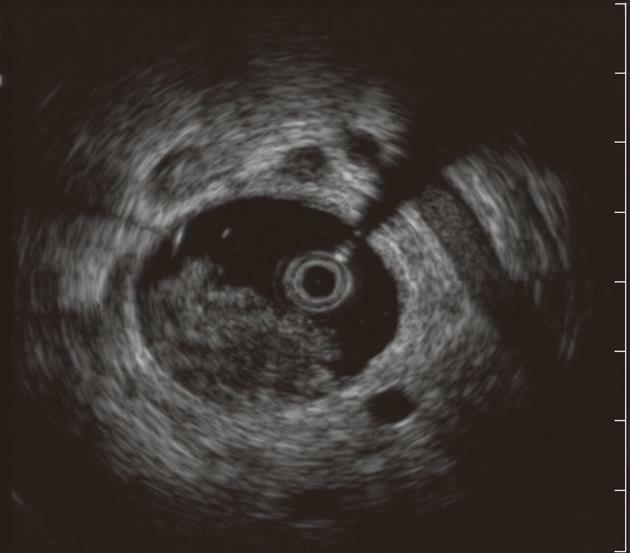 EUS-FNA can be performed subsequently if tissue samples obtained during ERCP are non-diagnostic. Figure 3 Endoscopic diagnosis and therapy for a bile duct mass missed on transabdominal imaging. 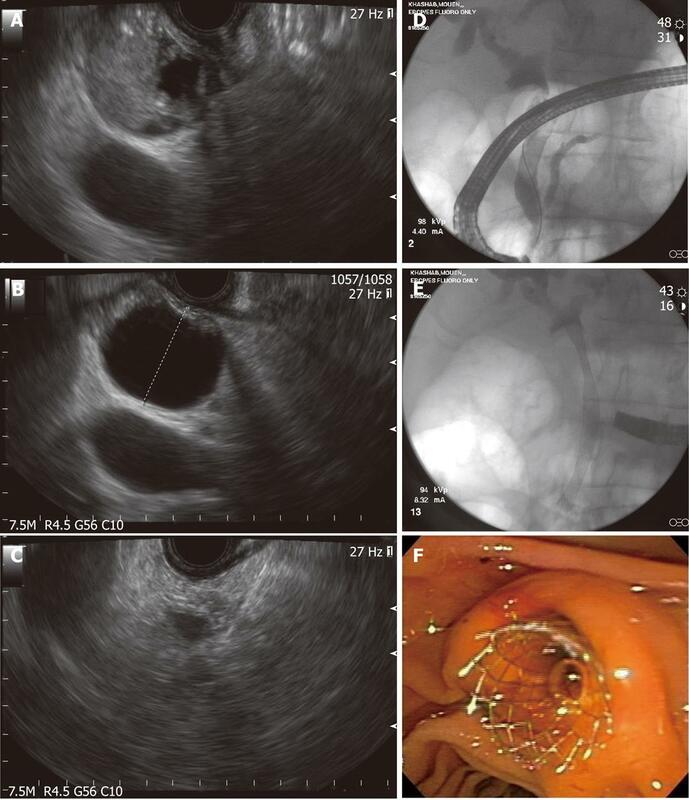 A: Endoscopic ultrasound showing a bile duct mass that was missed by computed tomography and magnetic resonance imaging; B: Biliary dilation was present proximal to the stenosis; C: Endoscopic ultrasound-guided fine needle aspiration was performed and was diagnostic of cholangiocarcinoma; D: Endoscopic retrograde cholangioscopy was performed during the same session and cholangiography revealed distal biliary stricture; E, F: A fully-covered metal biliary stent was placed. Direct visualization of biliary strictures through cholangioscopy (percutaneous or endoscopic) may improve the diagnostic yield of cholangiography and routine cytology. Percutaneous cholangioscopy is effective in visualizing the biliary tree; however, it requires a percutaneous biliary access and repeated dilations to accept the cholangioscope. The use of “mother-baby” scopes have fallen out of favor due to requirement of two operators, fragility, suboptimal irrigation systems, and lack of 4 way tip deflection (Figure 5). The Spyglass direct visualization system (Boston Scientific, Natick, MA, United States) allows for single operator cholangioscopy (SOC)[54-56]. The components of the SOC system include the disposable SpyScope (Boston Scientific), a 10Fr access and delivery catheter with a 1.2 mm diameter working channel and 2 dedicated irrigation channels (Figure 6). It is introduced through a duodenoscope with a minimum working channel diameter of 4.2 mm. The catheter is capable of tip deflection of at least 30 degrees in 4 directions[54,56]. The reusable SpyGlass Fiber Optic Probe (Boston Scientific) provides 6000 pixel images. The disposable SpyBite Biopsy Forceps (Boston Scientific) incorporates jaws at the tip designed to excise and retrieve visually targeted tissue. Figure 5 The “mother-baby” scope cholangioscopy system. The main disadvantage of this system is the requirement for two endoscopists to perform the procedure. 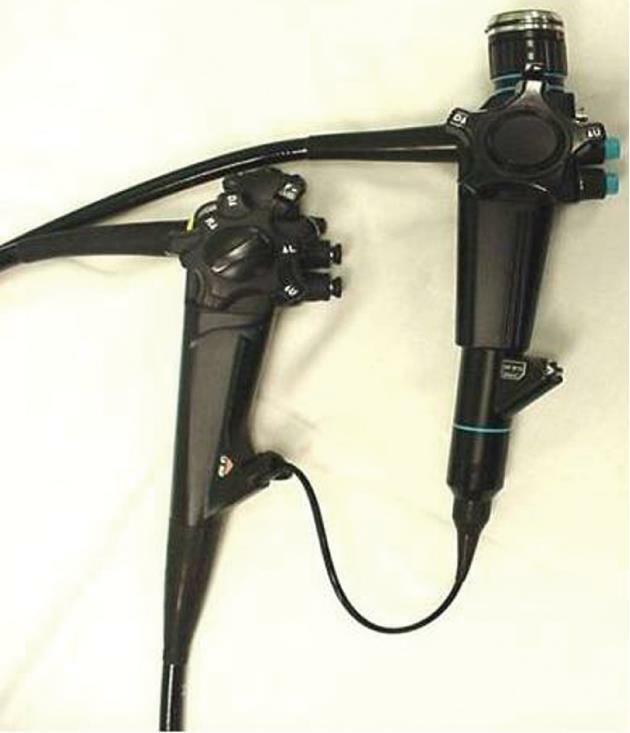 Figure 6 Spyglass single operator cholangioscopy system. A: SpyScope 10Fr access and delivery catheter; B: SpyGlass fiber optic probe; C: SpyBite biopsy forceps. An initial prospective observational feasibility study at 2 tertiary medical centers demonstrated that the SOC system can provide adequate samples for histologic diagnosis and to successfully guide stone therapy. Subsequently, Chen et al conducted a larger scale multicenter prospective observational study of SOC procedures in 297 patients with biliary strictures and/or stones and aimed to provide confirmatory evidence that direct visualization using the SOC system can aid in the diagnosis of biliary disease and facilitate stone therapy. The overall procedure success rate was 89%. SOC visual impression had a sensitivity, specificity, positive predictive value and negative predictive value for diagnosing malignancy of 78%, 82%, 80% and 80%, respectively (Figure 7). For SOC-directed biopsy, the respective results were 49%, 98%, 100% and 72%. Sensitivity was higher (84% and 66%, respectively) for intrinsic bile duct malignancies as compared to non-intrinsic malignancies. Diagnostic SOC procedures altered clinical management in 64% of patients. The incidence of serious procedure-related adverse events was 7.5% for diagnostic SOC. Ramchandani et al recently described a sensitivity of 95% and specificity of 79% for visual impression during Spyglass cholangioscopy in 36 patients with indeterminate biliary strictures. Both sensitivity and specificity were 82% after utilizing Spybite cholangioscopic biopsies. Draganov et al reported that the SOC guided biopsies had significantly higher accuracy of 84.6% as compared to standard transpapillary biopsies and cytology with accuracies of 53.9% and 35.5%, respectively. The authors were careful to point out that SOC guided biopsies had suboptimal negative predictive value of 69.2% over the mean 22 mo follow up. These results suggest a benefit of SOC in patients with indeterminate biliary strictures. Visual impression of malignancy is an integral part of cholangioscopy, especially that the yield of SpyBite biopsies is suboptimal. Presence of “tumor vessels” within biliary strictures during cholangioscopy is indicative of biliary malignancy. These irregular, dilated vessels are due to neovascularization at the site of the stricture due to tumor growth. Their presence has sensitivity up to 100% for malignancy. Intraductal nodules and masses (Figure 8) can be visualized during cholangioscopy and are indicative of malignancy. However, these ductal findings are only visualized in a fraction of patients with cholangiocarcinoma. Biliary mucosal changes can be further delineated using methylene blue-aided cholangioscopy. In a feasibility study, Hoffman et al showed that normal and non-dysplastic mucosa was characterized by a homogenous light blue staining pattern, where as inflamed and dysplastic mucosa was characterized by intense and inhomogeneous dark blue staining. More studies are needed to depict the utility of chromoendoscopy during cholangioscopy. 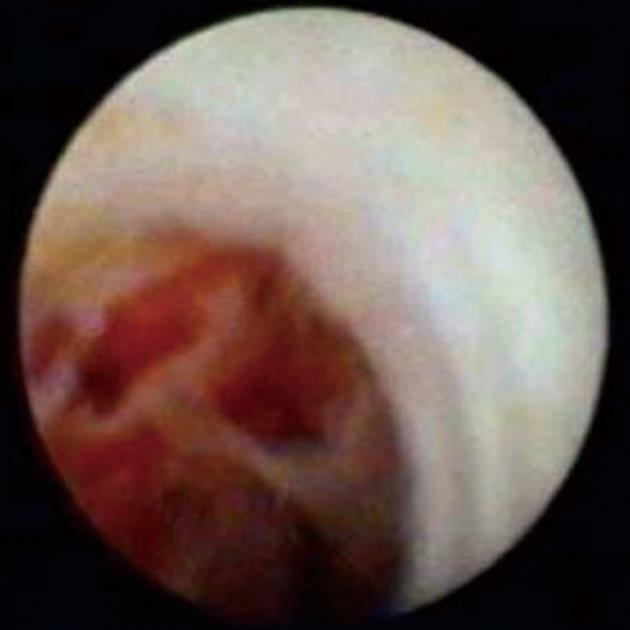 Figure 7 Single operator cholangioscopy used to obtain a diagnosis in a stricture with nondiagnostic cytology. 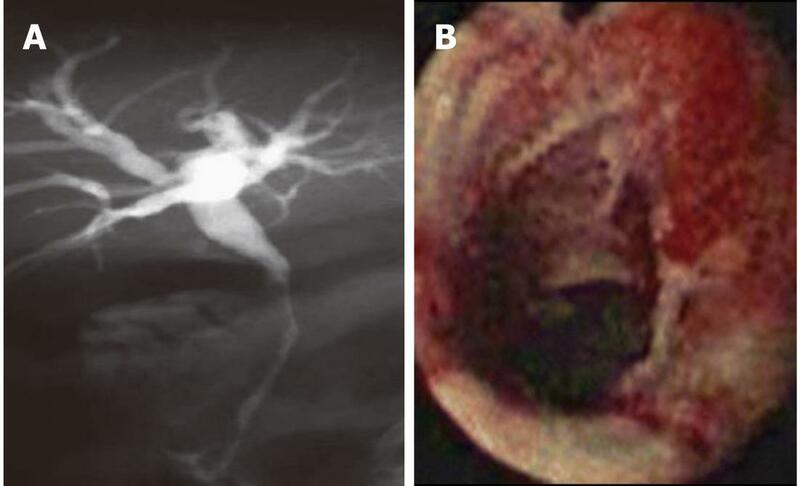 A: Magnetic resonance cholangiopancreatography showing a long distal biliary stricture with proximal biliary dilation. Endoscopic retrograde cholangiopancreatography with brushing was non-diagnostic; B: SpyGlass cholangioscopy revealed a malignant-appearing ulcerated biliary stricture. Spybite biopsies confirmed cholangiocarcinoma. Figure 8 SpyGlass cholangioscopy revealing a bile duct mass. This is indicative of cholangiocarcinoma. SOC is a technically feasible but is currently not a first line modality for evaluation of biliary strictures. It has some limitations. The 10 French catheter size typically requires sphincterotomy to advance the cholangioscope into the bile duct. At times due to the location and diameter of the stricture, the system cannot be advanced to the desired location. Complications for ERCP with cholangioscopy are reported by Chen et al as 7.5% for the diagnostic SOC. Sethi et al report that ERCP with cholangioscopy had complication rate of 7.0% as compared to the ERCP only rate of 2.9%. Subgroup analysis revealed a high proportion of cholangitis in the cholangioscopy group. They postulate that this may be due to the saline infusion used in cholangioscopy. Draganov et al did not report any episodes of cholangitis in 26 patients who underwent SOC for indeterminate stricture. A recent editorial from Gaidhane et al suggests that this lack of cholangitis may be due to aggressive biliary drainage in these patients. Confocal laser endomicroscopy permits real time histologic evaluation during endoscopy. Probe-based confocal laser endomicroscopy (p-CLE) can be used to generate microscopic information during ERCP. The CholangioFlex probe (Maunakea Tech, Paris, France) is specially designed for p-CLE during ERCP procedures and has been miniaturized to have an external diameter of 0.94 mm. The probe fits in the 1.2 mm diameter working channel of a cholangioscope. The probe can be inserted as a standard ERCP accessory device. The radio opacity of the probe tip allows for fluoroscopic guidance and probe positioning, and the optical penetration of the confocal plane provides subsurface information with no interference from bile or solid residues. In a feasibility prospective study on 14 patients with indeterminate biliary strictures, the investigators predicted neoplasia with a sensitivity of 83%, specificity of 88%, and accuracy of 86%. In a larger study of 102 patients with indeterminate pancreaticobiliary strictures, the overall diagnostic accuracy of pCLE was 81%. p-CLE resulted in a significant increase in overall diagnostic accuracy of ERCP with tissue acquisition (90% vs 73%, P = 0.001). Biliary p-CLE is still in its infancy and requires further study before its routine use in the work-up of indeterminate biliary strictures is recommended. Direct peroral video cholangioscopy (D-PVCS) involves direct insertion of an ultra slim endoscope into the bile duct. This is advantageous as it requires one operator, provides high quality digital images (including narrow band imaging), provides separate water and air channels, and allows a larger working channel for diagnosis and therapeutics[68,69]. D-PVCS has been accomplished using a variety of methods including direct insertion, wire-guided insertion, overtube-balloon assisted insertion, occlusion balloon-assisted insertion, and anchoring balloon-assisted insertion. D-PVCS requires an adequate biliary sphincterotomy to facilitate insertion of the ultra slim scope. Insertion rates have improved with intraductal anchoring balloons. Moon et al reported insertion success of 95.2% using an intraductal balloon catheter. A dedicated anchoring balloon system was subsequently developed by Cook Medical (Winston-Salem, NC) to facilitate D-PVCS. However, few episodes of cardiac and cerebral air embolisms have been reported with this system and were thought to be due to bilio-venous fistula. Carbon dioxide insufflation during D-PVCS may decrease or eliminate embolization risk. However, this has to be further studied in animal models before embarking on further human studies. In conclusion, indeterminate biliary strictures remain elusive. ERCP with routine cytology and transpapillary biopsy is the first diagnostic test of choice, especially in that these strictures often require treatment with dilation and/or stenting. Advances in endoscopic and cytopathologic techniques and accessories have improved the diagnostic yield of endoscopic work-up. These advances include EUS +/-FNA, IDUS, cholangioscopy, ancillary cytology techniques, among others. If initial ERCP with routine cytology and biopsy is non-diagnostic, one or a combination of these diagnostic techniques is warranted. The choice of what next diagnostic modality should be used should be individualized and depends on local expertise, patients’ anatomy, comorbidities (e.g., PSC), and preferences.